There is still a long way to go. The ANC continues to work to guarantee the mobilization, to expand the majority favourable to independence and to begin to imagine, collectively, what the country in construction should be like. There is a lot of work for everybody if we want to expand the democratic surge towards a referendum and make an inclusive Catalan Republic a reality. The referendum campaign was the most intense since the restoration of democracy, and Catalonia’s national day on 11th September was the great launching party. More than a million people filled the centre of Barcelona and were emotionally moved with a minute’s silence for the victims of the terrorist attacks in Barcelona and Cambrils. 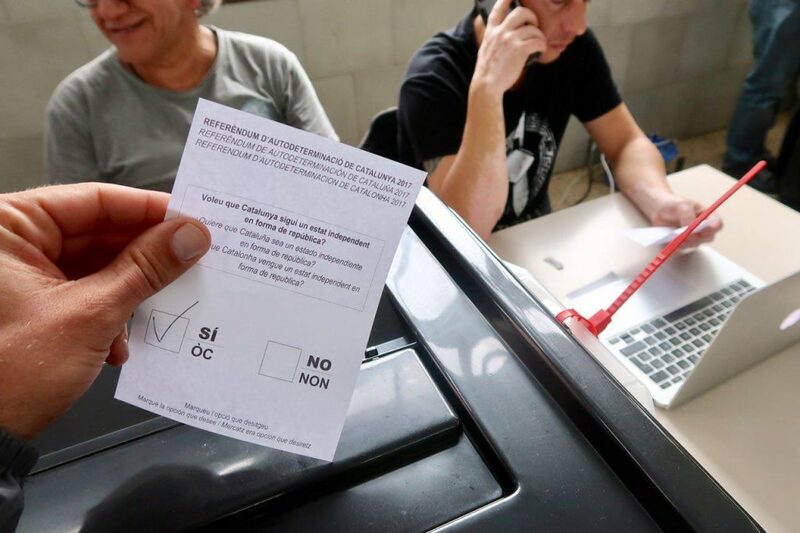 With the announcement of the referendum date and question, the independence entities were massively mobilized to inform the world that the Catalans would vote “even if the Spanish state does not want it”, as Pep Guardiola said in an electrifying act at Montjuïc. 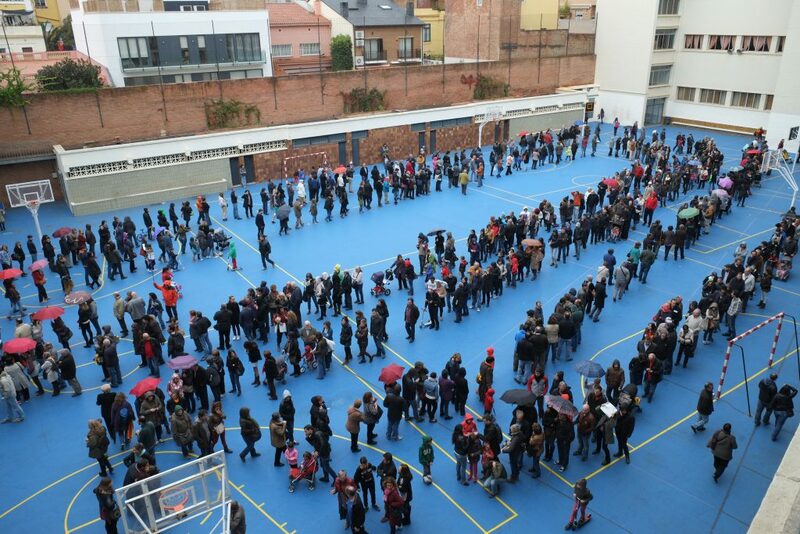 The 2016 mobilization consisted of five simultaneous events in the cities of Barcelona, Lleida, Berga, Salt and Tarragona. Each city highlighted a theme the new Republic will have to address. 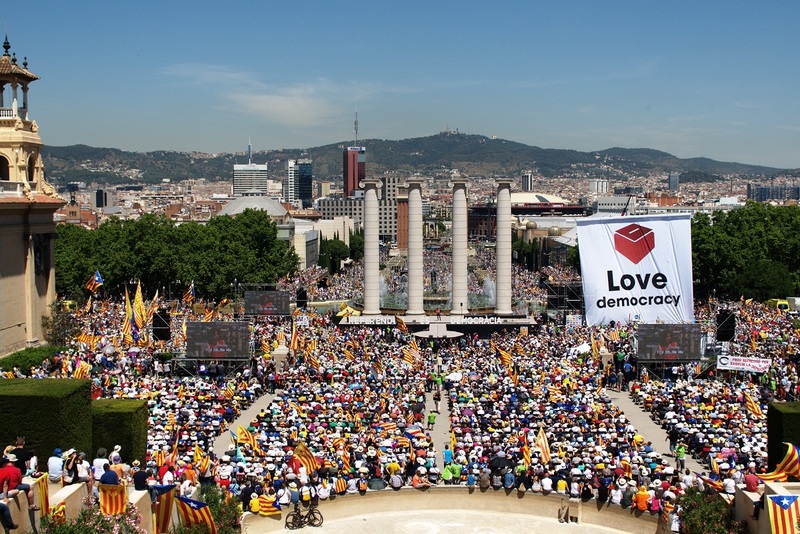 Over a million Catalans joined forces in order to complete a successful liveTV interaction event calculated down to the second, as participants in every city needed to be able to see what was going on in the other four. Right after the demonstration, President Carles Puigdemont vowed to hold the expected self-determination referendum in September 2017. After the elections to the Parliament of Catalonia on September 27th, 2015 and a process of negotiations between the Together for Yes and the CUP parties, in which sovereign entities such as the ANC supervised the agreement, on Saturday, January 9th an agreement between the two groups was announced. This agreement meant that the next day, on Sunday, January 10th (just one day before the legal deadline for the election of the president), the mayor of Girona and Deputy-President of Yes, Carles Puigdemont Casamajó, was to be invested as the 130th president of the Generalitat in the first round of votes. In this way, Catalonia started up the process towards the creation of the Catalan Republic. Parliament approved the resolution of Joint Parliamentary Groups for Yes and the CUP, through which the Catalan Chamber declared “the beginning of the process of creation of an independent Catalan State in the form of a republic”. One of the highlights of the text approved is the one warning that Parliament and the process of democratic disconnection would not be subordinated by the decisions of the institutions of the Spanish State nor, in particular, of the Constitutional Court. The resolution also established the opening of a “non-subordinate” constituent process detailing the subjects on which the future Government would only comply with Catalan legislation. The parties with a clear independence programme (Together for Yes and the CUP) achieved an absolute majority with an historical participation and obtained 72 MPs and 48% of the votes against 39% of the votes obtained by parties clearly aligned with non-independence This was a clear democratic mandate for starting the construction process of the Catalan Republic. The freeway to the Catalan Republic gathered over a million people forming a giant human mosaic over 5.5 km long, right in the middle of the political campaign of the 2015 Catalan election. Yet again, a massive, quiet and peaceful demonstration stretched from the northern edge of the city of Barcelona to the gates of the Catalan Parliament along the Meridiana avenue. Pro independence coalitions and parties won a landslide majority in the elections held on September 27th and agreed on a roadmap to a binding independence referendum, due in September 2017. Jordi Sànchez replaced Carme Forcadell as President of the ANC when he was elected by the members of the Secretariat after the voting of the members, according to the statutes of the entity. 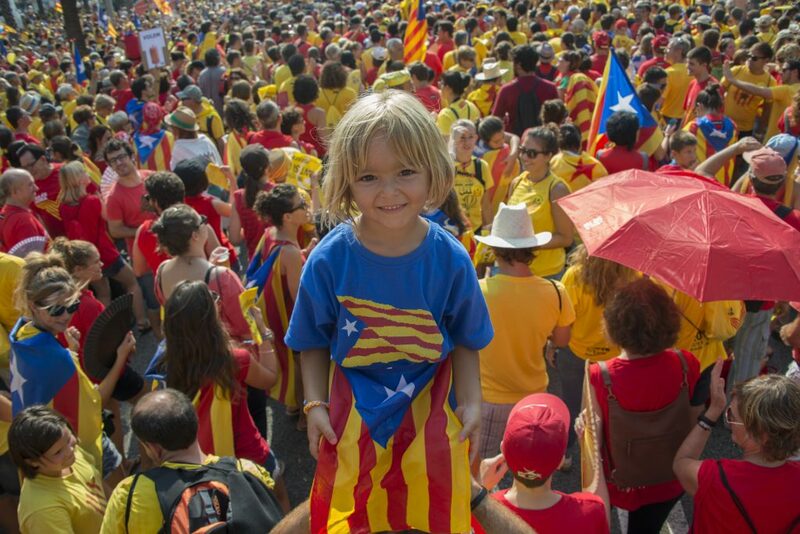 2,305,290 people defied threats and fear propagated by Spain and participated democratically in the consultation on independence. More than 80% voted in favour of an independent state. The 9-N became an historic event, nevertheless it didn’t show a clear democratic mandate in favour of independence. Faced with the impossibility of conducting a politically agreed referendum, the only way out was the holding of plebiscite elections. 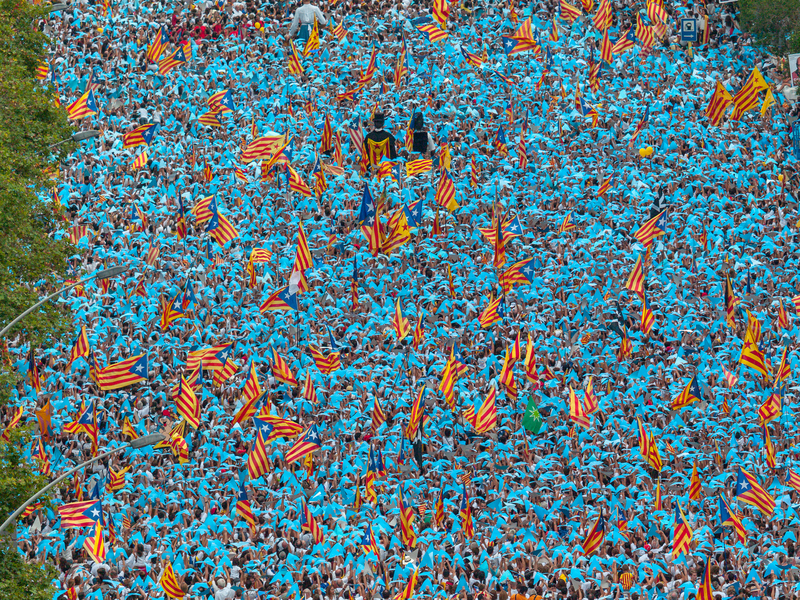 More than 1,800,000 people, according to official sources, filled the heart of Barcelona in an immense demonstration of strength to make the 9-N inevitable. 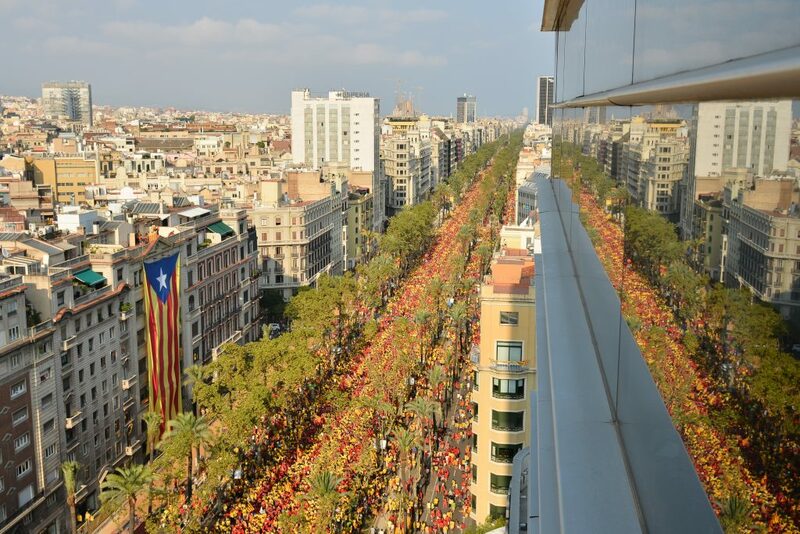 The participants formed a mosaic of the Catalan flag and a large V representing Voting, Will and Victory, which filled the Gran Via de les Corts Catalanes and Avinguda Diagonal. 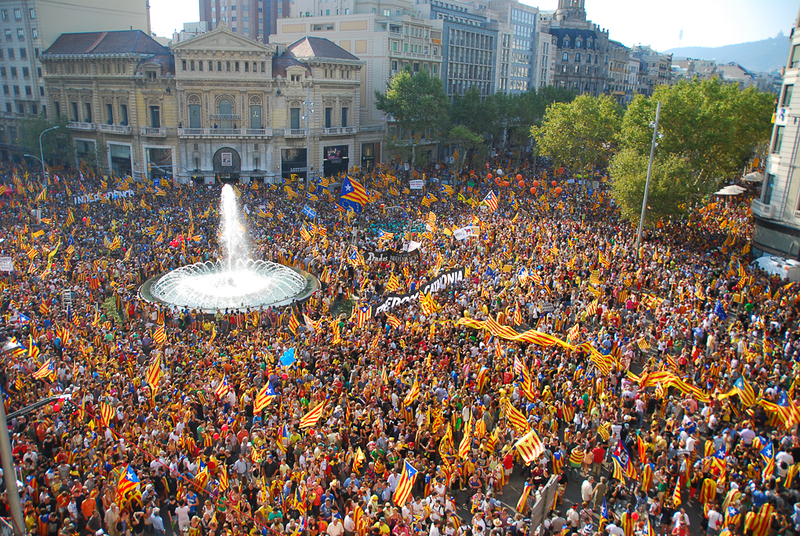 The demonstration was structured within the unitary campaign “Now is the time”, invented by the ANC and Òmnium Cultural, as the slogan for winning the consultation. 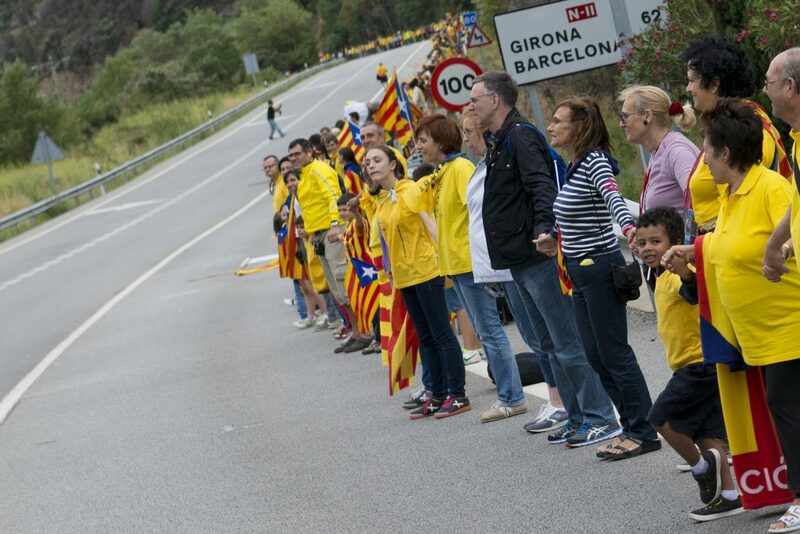 The ANC organized a huge human chain of 400 kilometres throughout Catalonia, from Pertús to Alcanar to claim independence. It was the result of months of work throughout the territory, with various events and campaigns to push the process and ensure the success of the Via. The mobilization capacity of the previous year was added to the logistical and organizational capacity ensuring that there were people in all sections of the chain. In her speech, Forcadell called on the institutions to “demand the consultation immediately without losing time”. 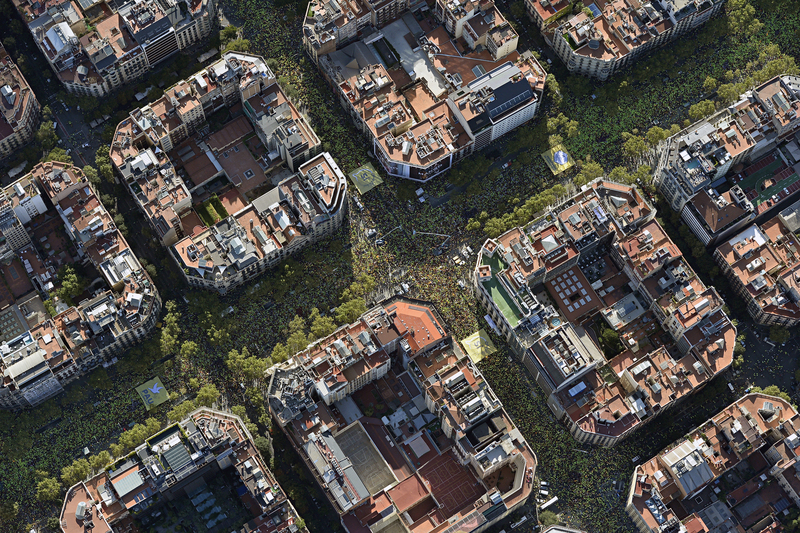 The historic demonstration on 11th September modified the Catalan political map and lead to early elections. The elections of 25th November implied the transformation of an autonomous Parliament to a sovereign one, with a wide representation of parties favourable to the celebration of a consultation on the independence of Catalonia. Under the slogan “Catalonia, a new state of Europe”, a human tide filled Barcelona in the most massive demonstration in the history of the country. The then President of the Parliament, Núria de Gispert, received a delegation from the Assembly, which demanded the beginning of the process of separation from Spain”. This demonstration was the culmination of the March for Independence, which started on June 30th and filled the summer with different events throughout the territory. ANC members chose the executive body of the ANC that would direct the entity for a year and would be responsible for completing the approved roadmap. Carme Forcadell, the most voted candidate, became president of the Assembly on April 22nd, a position that would last until May 16th, 2015, after completing a maximum of three mandates established in the statutes of the entity. The Palau Sant Jordi was the scene of the birth of the Assembly. 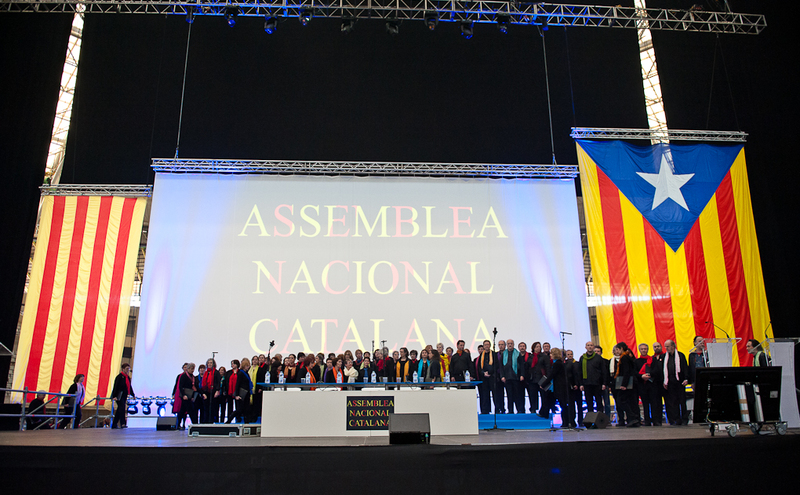 After a year of growth within Catalonia with numerous acts and the creation of hundreds of territorial assemblies, 7,000 people participated in the ANC constituent assembly. 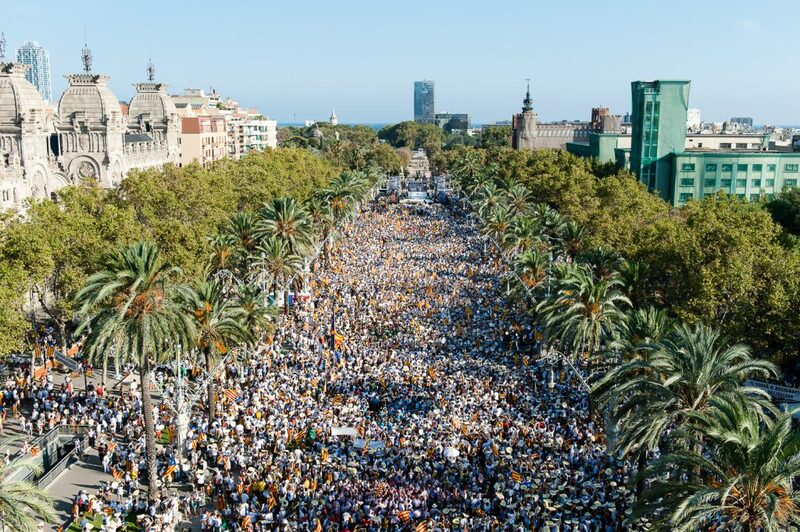 The objective was to unite independence from within the general public culminating in an important demonstration in Barcelona on 11th September. On this date, 1.300 people celebrated the National Conference for an Independent State in the Palau de Congressos de Barcelona. This was the result of a project to configure a transversal and non-party entity, heir to the movement for popular consultations on independence. The Conference appointed a provisional executive that would be responsible for constituting and provoking the growth of the Catalan National Assembly within the period of one year.